Tech researcher and consultancy Forrester has agreed to acquire b2b research and advisory firm SiriusDecisions, for $245m in cash, subject to adjustment. Sirius provides b2b companies worldwide with services including industry analysts, best practice research, benchmark data, peer networks, events and continuous learning courses; with the aim of optimizing marketing, sales and product operations. The company is based in Wilton, CT with offices in Austin, TX; San Francisco; Waltham, MA; Toronto; London and Singapore. Forrester says the combination will create 'an innovative strategy and operations platform that can help business and technology leaders make the far-reaching changes needed to adapt to a customer-led, disruption-rich market while maximizing performance every day'. Specifically, Forrester says the buys gives it new opportunities cross-selling services to the two client bases; widening distribution of SiriusDecisions' products in EMEA and APAC via Forrester's sales force; expanding Sirius' platform beyond marketing, sales and product to roles in IT and customer experience; and bringing it to new vertical markets, including the Forrester growth areas of financial services, retail, healthcare, energy and utilities. Forrester CFO Michael Doyle says the buy is expected to add c.$100m to revenue in 2019 on a pro forma basis. Chairman and CEO George F. Colony comments: #Empowered customers and the disruptive power of technology are forcing business and technology leaders to take decisive action and make deep-rooted changes while delivering quarterly results. The combined value of Forrester's strategic and SiriusDecisions' operational capabilities will help our clients change and grow in tumultuous times'. The transaction is expected to close in January 2019, subject to the satisfaction of customary closing conditions, and is expected to be funded through a combination of cash on hand and up to $175 million of fully committed debt financing. 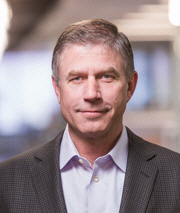 Rich Eldh (pictured), SiriusDecisions' cofounder and co-CEO says the deal 'changes the game for our clients and accelerates our growth across industries, regions, and business functions. Beyond the powerful synergies of our two firms what will make this work is our shared passion for our clients' success'. The companies are online at www.siriusdecisions.com and www.forrester.com .